- TECHNIQUES that don't require you to have any understanding of women at all. You can be shy, UGLY, and a geek and they will work. 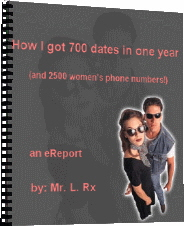 IN FACT these TECHNIQUES will not only get you 100's of dates, but the sheer experience of going out on 100s of dates will give you a better understanding of women than anything you could ever read in a book-anything that I or any other GURU could ever say to you. - This REPORT is GUARANTEED to change your love life. That is why I wrote it.